I'll be the first to tell you that I truly do not know exactly what God is doing in our lives right now. I feel perplexed, unsettled, and completely at a loss as to how to figure things out. In our circumstances, I think often of Joshua 3:3-4. "And they commanded the people, saying, When ye see the ark of the covenant of the LORD your God, and the priests the Levites bearing it, then ye shall remove from your place, and go after it. Yet there shall be a space between you and it, about two thousand cubits by measure: come not near unto it, that ye may know the way by which ye must go: for ye have not passed this way heretofore." We have not passed this way before—not even close. Life feels very unfamiliar, and as Joshua instructed the children of Israel, my little family and I are trying with all our might to stay "2000 cubits behind the ark," as we lean hard on God for guidance. We don't want to rush out ahead of Him, nor do we want to lag too far behind Him. Doing either would mean getting outside the parameters of what it means to stay in the center of His will. As I struggle to "understand His logic," and I repeatedly come to the realization that my thoughts are so far beneath His, and I will never be able to think like He does, I am continually coming back to the same conclusion—"when we can't understand His logic, we must trust His wisdom." As He calls us out into deeper waters, I am learning that each step forward requires a deeper level of trust. As the water depth increases, so does the necessity to more fully trust Him. In the midst of my questions and anxiety over the future and all that is happening, He did something recently that completely arrested my attention. He always knows when we need extra assurance and confirmation that He is with us, doesn't He? We had to be away from home for an extended period of time, and on the night before we were to leave to come home, I called our home voicemail to get our messages. There was a message from our neighbor asking us to call her. I tried, and when I got her voicemail, I left a message for her. I didn't hear back, and we left to come home the following morning. On our way, it hit me that I didn't hear back from her, so I texted her asking if everything was okay. She texted back saying she needed to talk to me, and I instantly knew something was wrong. You might know that our cell phone has been having issues, not allowing us to make or receive calls, so I texted her back explaining about the phone and asking her if she could text us instead of talking. She texted back and told me that she was out of state at the time, but another of our neighbors had called her to tell her that the 3rd-floor french doors that lead from Zach's bedroom to his balcony were standing wide open! Keep in mind that there are no screens on the doors! I asked her how long they had been open, and she said for two weeks! The other neighbor hadn't known for sure that we were out of town, and she didn't know how to reach us. After such a long time, she called and mentioned it to the neighbor who had contacted us. Instantly, we began to wonder how the doors came open, and of course, the first thought was concern that someone may have broken in. But, how? They would have had to use a very tall ladder, and it just wasn't likely that this had happened. Then it hit us. Not long after we left home, Hurricane Florence had passed through our area! We figured Zach's doors must not have been securely latched, and the hurricane winds had blown them open. Imagine the scenario. We were a few hundred miles away from home, in the car, traveling, and this is the news we received. You can just picture the thoughts going through our minds. Strong winds, possibly heavy rain, wide open doors for two weeks, etc. What had blown out of or into Zach's room? Did excessive rain come in through the open doors and damage the flooring? If the wind was strong enough to open the doors, had it caused harm to any of Zach's things? Had birds, insects, or animals made their way in? Not only Zach's room was exposed but his doors being open had made the whole house vulnerable! Right there, in the car, the three of us prayed, and we spoke faith into our situation. We chose to believe that GOD had taken care of everything, in spite of the potential for our home being violated. I am not going to say it was an easy ride home. Worry tried to overwhelm time after time as we kept putting it back in God's hands and realizing there was not one thing we could do BUT trust Him and His protection. I kept thinking how merciful it was of God to NOT let us know there was a problem until the very day we were on our way home. He wanted to warn us of what was going on before we got home and saw those doors open and panicked, and yet, He withheld the information from us during the time that we could not get away to leave to come home and check things out. He withheld that information from us until just a few hours before we returned home! We finally made it home safe, by God's grace, and as we pulled into our parking area, Kevin told me that he and Zach would go in first to assess what was inside. Bless his dear, kind, thoughtful heart, he wanted to spare me from seeing it first. As I stood downstairs anxiously staring up at Zach's wide-open doors, I recalled the morning we left, and how, like every other time we get in the car to go anywhere, I had prayed this prayer, "Lord, please protect us, bring the three of us safely home together, protect everything here while we are gone, and let everything be just as we left it when we return." Leaving home, we had placed everything we had in God's hands, trusting Him to watch over it while we were gone. As I stood on the ground outside under Zach's room and balcony, what was actually only a few seconds felt like an eternity. Then my heart rejoiced to hear the reassuring voice of my dear, even-keeled husband say, "Honey, everything is fine. I don't see anything wrong at all." All I could do is praise the God who sees—who hears—who knows every, single thing about every, little detail of our lives—who cares more for us than we can ever even imagine. The relief that flooded over me was enormous. But, even more than my relief was utter astonishment at what Kevin was telling me. My mind replayed the whole thing once more—of all times, a hurricane had come through (of course we did not get anywhere near the brunt of the storm, but nevertheless, there had to be some awful strong wind to blow those doors open), who knows how much rain had fallen, etc. I tell you what, as soon as I could come inside, the three of us prayed together, this time a prayer of wholehearted thanksgiving and praise to the God who loves us with an everlasting love, who hears us when we pray, and who faithfully answers those prayers! Oh, how we praised Him and continue to praise Him! There is just no explanation why things were "just as we left them when we returned" other than our dear, loving, faithful God answering the prayer we prayed that morning in the car. God's providential care should never be underestimated. It is there when we don't even realize how desperately we are in need of it. Oh, the lessons He has taught and is steadily teaching us through this! At the beginning of this post, I mentioned how unfamiliar and uncertain everything feels to us right now. If God can shield our home from invaders of any kind, from hurricane rain and wind damage, and from all harm when we didn't even know we needed the extra protection, can He not take care of our future? We don't understand the logic of all that has happened and is happening in our lives, but God is all-wise. We don't need to understand His logic. We simply need to trust His wisdom. We simply need to believe with all our hearts that He never takes His eyes off us and all that affects our lives. "The LORD will perfect that which concerneth me: Thy mercy, O LORD, endureth for ever." I know He absolutely allowed those doors to come open and for us to find out they were open for two weeks without us knowing about it just to prove that we do not even need to know what is going on for things to be okay. The only one who needs to see the whole picture is Him. He is in control. We do not have to be. He takes care of us and what pertains to us even when don't realize we need taken care of. When we turn our lives over to God and hand Him the reins, we are no longer responsible. Total surrender to God means letting go—completely. Turning loose. No longer worrying about the outcome. Trusting that whatever comes our way passed through His hand first and only made it to the point of touching our lives after getting His permission. We do not need to fear getting out of His will. He will make things evident to us on a need-to-know basis. It is all about trusting His wisdom. He is not going to shine a flashlight several steps in front of us and hand us a schedule of life events, along with the dates they will happen. If He did that, why would we need faith? God's ways are far higher than our ways. "Behold, God is great, and we know Him not, neither can the number of His years be searched out." Dear friends, I do not know what each one of you is going through. I don't need to know. God already does, and none of it surprises Him. He absolutely has you in the palm of His hand, and you are going to be okay. It may look like the enemy has the upper hand, but there is no hand higher or more mighty than our God's. He is in control of every little and big detail of your life. He is watching out for you when you don't even know you need to be. If it touches your heart, it touches His. You are the apple of His eye, and He loves you with an unconditional, unchanging agape love that will never end. He leads you gently, and He often spares you the worst details. He will let you know what you need to know when you need to know it. You don't have to be suspicious of Him because He has no ulterior motives. He always, always has your best interests at heart. When you can't understand His logic, trust His wisdom. In closing, I hope you enjoy a song that encapsulates and expresses my personal testimony right now. After the song, please scroll down for updates on Mom Smith and Barbara Smith. Mom Smith is holding her own. She is adjusting to being in rehab. Bless her dear heart, she is in a lot of pain, at times, but she seems to be tolerating her daily exercises pretty well. She is such a little trooper and fighter, and God is seeing her through. Barb found out that her brain tumor is a glioblastoma and is inoperable. She had to undergo a biopsy on Thursday, and she and her family will find out the results tomorrow. You will never know how much we all appreciate each prayer that is going up for these dear ones. We so appreciate your continued prayers to the One who is in control and who has never failed one of His trusting children. God bless each one of you and meet every need you have. Cheryl, I love and so agree with this quote from your post: "When we turn our lives over to God and hand Him the reins, we are no longer responsible. Total surrender to God means letting go—completely. Turning loose. No longer worrying about the outcome. Trusting that whatever comes our way passed through His hand first and only made it to the point of touching our lives after getting His permission." Heavenly Father, we ask that You wrap Your Loving Arms around Cheryl and her family, Barb and Mom Smith, give them a continual sense of Your Presence. We ask that You give them Your comfort and Your Peace. You are El Shaddai, Almighty God nothing is too difficult for You. We know You never make a mistake, that You do all things perfectly, and You are always on Time. As in all things, we ask that Your Will be done, we will keep looking to You as our Savior and our Lord. In Jesus' name we pray, amen. Many blessings to you, dear friend. Oh, so very thankful for you, my faithful, sweet friend, and your precious prayers! That was an anointed, powerful prayer, and I can't thank you enough. Your prayers and friendship are God-given gifts, and I love and appreciate you so very much! Oh, what powerful words! That is just beautiful, sweet friend, and how I wish I could hear you sing it! I know your beautiful voice just adds to the anointing of the song. I am not sure if I have ever heard that, but it seems like maybe I have. Thank you so much for sharing it with me. The words are such a comfort to my heart! Sending much love and many hugs your way. God bless you abundantly! Cheryl your family has gone through so much this year. I'm sure the Lord has good reasons for what He is doing in your lives. We often what is He teaching when things like this happens. I'm so sorry to hear that Barb has a glioblastoma. I will pray for a miracle for her and continued prayers for Mom Smith. Thank you, dear friend! I got your beautiful package in the mail and am SO thankful to you!!! You are such a dear blessing, and I trust God will richly bless you in return! Sending much love and gratitude to you. I love that wonderful Scripture, too, dear Bettie. Praise God forevermore for the way His angels encamp round about us and deliver and protect us. He is SO faithful, and I could never praise Him enough! Sending love and hugs back to you, dear friend! That is exactly what my sweet mother-in-law said ~ there were angels guarding those doors. Oh, He surely is faithful God to all of us. Your precious words are SO comforting, dear friend. I can't thank you enough and send much love and gratitude to you and many, many blessings. Yes, I do remember when the dear Lord inspired me to write that very quote a while back, and I included it in a post here, and you told me you had written it down, sweet friend. It blessed me then and blesses me now. He is SO faithful to send us what we need right when we need it, isn't He? I do not know how people go through life without putting their trust in Him to see them through. Life is so perplexing and hard to navigate, at times, but He is ever faithful to us. So very thankful for your support and encouragement and sending hugs and blessings back to you! This post was a blessing to me. I always find hope and comfort when I visit here. You're welcome, Renee! Thanks for checking in and for all of your prayers and support! Thank you for these awe inspiring posts and for continuing to share your messages of faith and blessings with us. Thank you, my friend. Your encouraging comments, emails, and support means so much! May the Lord richly bless you! I love your words of wisdom that you shared, Cheryl..."when we can't understand His logic, we must trust His wisdom." Oh, how I need to remember those words, for they are so true! You and your family have been through so much, but God was there for you the whole time. Thank you for the updates on Mom Smith and Barb. Prayers will continue for all of you. Thank you, dear Kitty. God gave that quote to me when I was going through a hard trial. He just let me know that even when I am in those places that make no human sense, it is then that I must trust that He is doing the right thing. I am so grateful for your support and kind words, my friend, and your prayers are an invaluable gift. Sending love and gratitude to you! Oh, you are so right! It was quite a time of concern wondering what we would find, but in those moments, I was SO grateful that we have downsized so much, and it seemed to serve as such a comfort to my troubled heart. God has proven Himself SO faithful to us, I just have no words to thank Him enough. Your words meant SO much to me today ~ I cherish all you said and take it as coming straight from the Lord. I know you walk so close to His side, and you get your words from Him. Sending many hugs and blessings back to you and so much gratitude for your prayers and friendship. This is such an uplifting post because it shows so clearly God's care for us IN ALL THINGS! Sometimes I am amazed at the little things He takes care of for me, when I had no idea they needed taking care of. So glad for you that all was well when you got home. Thank you so much for sharing this post. I believe that God let Zach's doors remain open for 2 weeks to show you and your readers from around the world (I'm in Kenya) that He is still in control. Many of us are in such vulnerable situations where anything and everything can go so wrong but instead of worrying and fearing, this post has reminded us to trust Him and believe that all things work together for the good of those who love God and are called according to His purposes. In addition, though you may not see clearly what God is doing in your life in this season, I think it will be like when Martha and Mary sent for Jesus because their brother Lazarus was sick but He did not come until Lazarus had been dead for 4 days because Jesus said, "This sickness is not unto death but for the glory of God so that the Son of God may be glorified." (John 11:4) And, it turned out that way because Lazarus was raised from the dead and many who had come to mourn his death believed that Jesus was the Son of God. So the moral here is that you and we your readers have to continue trusting God while having faith that things will work out well the way you prayed in the car and chose to believe that God had taken care of everything. Dear Miriam! You had no idea what my family and I are facing today but GOD laid it on your heart to send these precious words of encouragement to us RIGHT at this very moment, sweet sister. I read your comment out loud to my husband and son through flowing tears. I could hardly talk. I NEEDED this so desperately, in this moment of time. It has been a hard day with bad news, and my heart has been so heavy with battling fear and seeking God for relief. THEN I opened email to find your dear, encouraging words! All the way from Kenya! I don't know what you may be going through, but I want you to know that God used you so mightily and the words you wrote were straight from His heart to our despairing situation. Oh, may the Lord richly and abundantly bless you!!! You will never know what this meant to us tonight. Sending much love and gratitude to you from the USA. Dear Cheryl, what an encouraging post that God is overseeing and protecting when we are unaware of what is happening. I can only imagine how hard it was to drive that day and not know what you would face when you returned home. God really cares for us and is always wise. I am praying for you and your family in this season, He does work everything for good to those who love him and are called according to His purpose! Hugs, prayers, and love sweet friend! Dear friend, I am SO sorry you are suffering! You are more than welcome to use this space for your needs any time you need to. This is GOD'S space, not mine. :) I am praying for you right now and trusting Jesus to lay His healing hand upon you. I do hope you are much better by now, as it has taken me so long. SO thankful that God sees and knows all, and He has been aware of your need from the moment it happened. He is so faithful! Please let us all know how you are doing when you can. Sending much love to you today. It was so encouraging to read your post. Thank you so much for the reminder that we can trust His Wisdom. Pray your mom continues to get stronger. And I pray for Barb's healing and God's grace. Thank you so much for your kind words, Dolly! Your prayers are so appreciated. May the dear Lord bless you! I also found it encouraging how God spared you from knowing earlier about the open doors. So gracious. Oh, isn't that so true? I have thanked Him SO many times since then that He spared us from that worry. It just goes to show that WE are not in control, He is, and even without our prayers, He does what He has already promised to do. We can count on His Word, praise His holy name! That is the oddest story. My, it sounds just awful. I do trust you are much better by now and feeling relief and the comfort of the dear Lord. You are more than welcome to ask for prayer here anytime! I am continuing to pray for you, my friend. Sending much love to you! Wonderful post, Cheryl. Thank you for sharing this story of God's provision. Bless you as you continue to trust. Thank you ever so much, Richella! I am so grateful for your kind words, support, and encouragement, and thank you so much for featuring this post. God bless you, my friend! Hi Cheryl ... don't you just love how God tends to us when things seem completely out of control. Hi Sweet Friend, This is such an incredible story of God's faithfulness. I love how you summed it up that if the Lord protected your home when you didn't know it needed protection,He certainly will keep you safe whatever journey He has planned for you. Your testimony is such a beautiful example of seeing God in ALL circumstances, even the hard to understand ones. 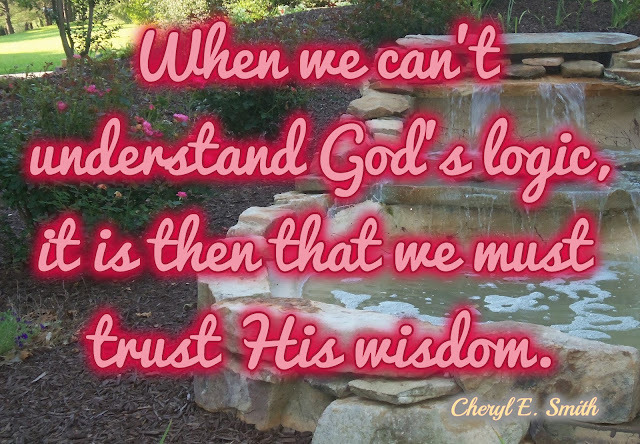 I loved the quote you shared about when it's hard to understand God's logic we can trust His wisdom. One of the most freeing ways I have found to pray is the verse you shared from Psalm 138 where it says that the Lord will accomplish all that concerns us. Just this week I came upon this verse from Psalm 139:10 "even there your hand will guide me, your right hand will hold me fast." I was especially struck by the Lord's hand "holding me fast". For it is He who keeps me steady even in the midst of uncertainty. Psalm 139 as a whole is my favorite Psalm. I believe the Lord has something wonderful planned for your family. Praying you feel peace and comfort as you wait upon the Lord for direction. Glad to see the update about Mom Smith. How is she doing? I feel so bad that it's been a while since I've been able to make it over here, but my life took on a whole other level of busyness. I just told my husband tonight. Overwhelmed isn't an adequate adjective to describe how I feel. But your words here in this post comforted me at just the right time as they always do. Praying for you sweet friend. May the Lord bless you and keep you and make His face to shine upon you and your family. Oh, sweet friend! I so enjoyed reading this precious comment and all the Scriptures you shared! You are right, that is a very freeing verse to pray. Have you heard the song called, "He Will Hold Me Fast?" Here is a link to it in case you happen to see this reply. https://www.youtube.com/watch?v=BsA_UPXnluw I just love this song. Oh, how wonderful to know that He will hold us fast! Thank you from the bottom of my heart for your unfailing friendship. I am SO thankful for your faithfulness to pray for us and for believing God has something wonderful planned for our family. You are such a dear blessing to me, and I trust the Lord will bless you richly for all you do. Sending much love and gratitude back to you! Hi Cheryl, Thank you so much for sharing that You Tube Link! I had never heard that song before! So beautifully moving and filled with soooo much encouragement! My heart, mind and body has been racked with anxiety, and this song ministered to me in a powerful, powerful way! I never cease to be amazed at how profoundly the Lord uses you to comfort and encourage me! You are truly one of my dearest friends! Oh, you are so welcome, sweet friend! I am so thankful you enjoyed that song! I do trust your anxiety is lessening. OH, I can relate SO much to what you are going through! You are surely one of my dearest friends, too, and I am SO grateful to God for your dear, encouraging presence in my life. Sending much love back to you! !